The picture to the left was the image I kept posted in my office. It was the image I saw everyday. It was my Habit 2: Begin With the End in Mind. 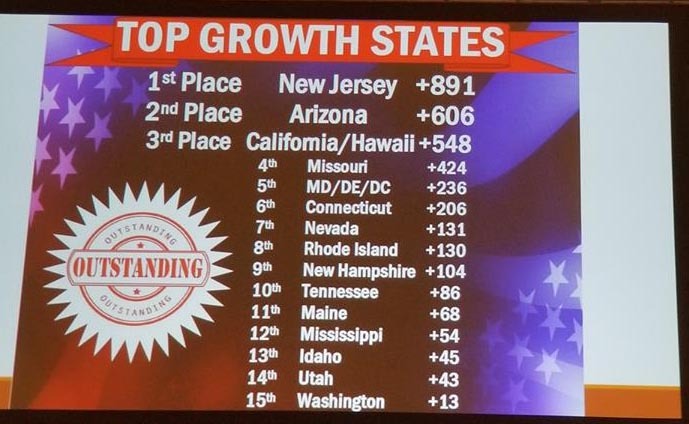 It was the goal; have the State of Texas up on the Top Growth States at Grand Lodge St. Louis. It was to have Texas seated somewhere closer to the stage than the back row of the convention hall. Selection as the Texas Membership Chair was announced in January 2019. The position officially started at the State Convention in June 2018. If we waited six months until June, we'd lose too much time. Add to that, the support of the District Deputies was needed and they weren't being Installed until July. At best, we were looking at an August start time. We needed to engage immediately. On February 6, 2019, the new membership process kicked off with the support of our State President Fred Adams and our State Co-Sponsors Charles Williams, PGER and John Amen, PGER. Intimate involvement of the District Deputies was a critical piece of Texas Membership success. On that date, our State Co-Sponsors gave approval to work with the District Deputy Designates as the cornerstone to a successful membership plan. In Texas, the Lodge Membership Committees included the Exalted Ruler, Leading Knight, Lodge Membership Chair, Lodge Secretary and one member for every 100 Lodge members. These were the minimum. Most Lodges had all of their Chair Officers on the Membership Committee. Every meeting has an agenda, meeting minutes and action items. The upcoming agenda, last month's meeting minutes and current action items are to be sent to the District Vice President and District Deputy at least three days in advance of their meeting. District Vice Presidents and District Deputies were encouraged to drop in on the membership meetings to help those Lodges who may be stuck and could use some ideas or recommendations. Whether you are a project engineer, doctor, lawyer or manager, reports are the foundational building block of any organization. The ideas expressed in reports are used as the basis of action and decision making. To ensure timeliness, reports would be submitted by each Lodge's Membership Committee to their District Deputy no later than the 5th of the month. The District Deputy would consolidate and summarize those report findings and submit their report to the State Co-Sponsors (copying the State Membership Chair) by the 15th of each month. As the State Membership Chair, those District Deputy reports were also consolidated and summarized, looking for areas where we were excelling or needing improvement. That report was sent to the State Co-Sponsors, State President, State President-Elect and Grand Lodge; with a courtesy copy back to the District Deputies. The reporting system was absolutely critical to our success. We also instituted monthly video teleconferencing using Zoom. It was an inexpensive solution that allowed anyone in the State of Texas to join in and ask questions relating to membership. Two more evenings were added to accommodate Districts that needed a different day of the month. We weren't strangers communicating by email. We were friends and colleagues who could see each other and share our challenges and successes. It was a personalized meeting experience. Also added to the membership system was a dedicated bimonthly newsletter that shared tips, successes and the Texas Cockpit Chart. The Cockpit Chart was created to make an easy place for Lodges, District Deputies or just the average member to easily assess how their Lodge, District and our State were doing on membership. The newsletter kept us all on the same journey. Tips from Grand Lodge, especially Rick Gathen's presentations, were chunked (individual pieces of information ‘chunks' and grouping them into larger units) over months. There was a feedback loop that allowed for members to submit a question or issue. These would be addressed in upcoming newsletters. During the last six to eight weeks of the year, the focus shifted to making candidates into members. We too often complain that we leave “candidates on the table.” This year, with the buy-in and support of every Texas Elk from the Lodge leadership through the District Deputy, we crushed it. 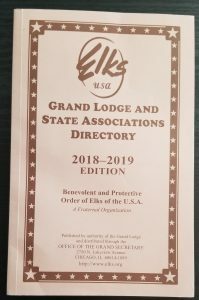 A week before the Elk year ended, I attended an Initiation on a Saturday at a Lodge in North Texas. I asked the Exalted Ruler to honestly assess how the membership process went this year. He replied, “It was a pain in the a$$, but it was worth it.” His specific Lodge ended last year at a -20 and closed this year at a plus 15. It was just one of many success stories from this year. Lastly, this process wasn't done in a vacuum. It was tested at a Lodge level. Then it was tested at a District level. Only then was the process rolled out throughout the state. The Top Growth States was a place I need to start. There was no more valuable resource than the Grand Lodge and State Associations Directory. Michael Penchenski, New Jersey's Membership Chair, was more than generous with his time and sharing the valuable information he attributed to his state achieving a plus 891. Rod O'Connor, Florida State Membership Chair comes from a process driven state. If Rod had the documents, he shared them. Andrew Housley, the New Mexico Membership Chair, routinely communicated together as we were both trying to overcome the same hurdles. To Michael, Rod and Andrew, thank you so incredibly much! This year's accomplishments can be directly attributed to your support! “If you keep on doing what you've always done, you will keep getting what you've always gotten.” How many times have we heard or spoken that sentence? This year, we stepped out to do something different. In less than one-year, we've made a tremendous turnaround. As preparations are made for our State Convention in June, there are many awards that need to be prepared. The extra effort from Lodges to District leadership will be gratefully acknowledged. Thank you.